If you live in a popular neighborhood or an area ripe for redevelopment, chances are you’ll receive an unsolicited offer from someone to buy your home. You don’t have to respond to the offers if you don’t want to—it’s not even rude—but if you’ve been thinking about moving, there are a few different tacks you can take. As real estate markets have tightened in the last few years, unsolicited offers to buy have increased. Real estate agents often employ this tactic after their buyer clients have been consistently outbid or otherwise frustrated by the traditional sales process. Their clients see a home they like and the agent puts together an offer letter and drops it in the mailbox. 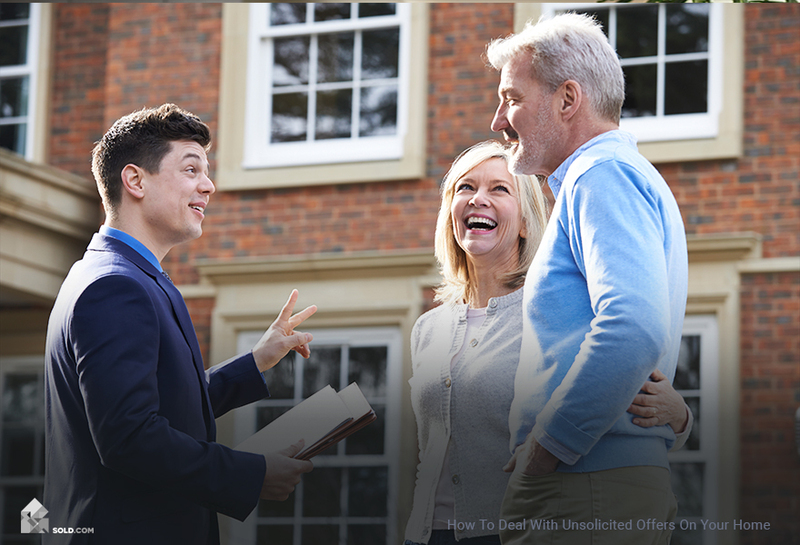 If you receive an unsolicited offer from a real estate agent and you want to move, you can hire your own agent to help you negotiate and the process will likely feel similar to a traditional sale. The only difference being, you have the upper hand since the buyers feel a greater sense of urgency than you do. The unsolicited offer to be wary of is one from an investor. Where a frustrated couple is more likely to purchase your home at the fair market value because they fell in love with it and they want to live there, an investor will try to lowball you. Because the investor wants to make money. 1. Do nothing. If you don’t want to move then it doesn’t matter how much the investor offers you, you politely decline and go about your life. If your property is adjacent to lots or land this investor has already purchased and the investor sees it as a necessary piece to realizing their vision of the project, you will likely get repeated offers. The investor may try to bully you into acquiescing. If there isn’t a price in the world for which you’d sell your home, then stand your ground and if you have to, hire an attorney. 2. Hire a real estate agent. If you’ve been thinking about moving for a while but just hadn’t gotten around to putting your house on the market, or if you’re not opposed to the idea for the right price, you might want to hire a real estate agent who has experience negotiating with investors. You want an agent who is familiar with this investor or who can get information on them easily. You want to know why they want your property and how much your property is worth to them. If the investor plans to tear down your home and build a high-rise apartment building or office space on top of the land, your home might be worth much more than its current fair market value. Understand the investor’s motives. The investor wants to buy your house so that they can make money. That means they will probably try to low-ball you or at the very least will not expect you to take their first offer. You also want to find out, if you can, what the investor intends to do with the property. They aren’t legally required to tell you and probably won’t. But if you google the company you can probably find a press release or news story about its plans for development. Or you can contact a well-known real estate agent in the area and ask them what they know about this investor. Find out the fair market value of your home. If it seems as if the investor simply wants to purchase your home in order to make a few improvements and then sell it at a higher price, they will likely not agree to buy your home for much more than fair market value. But if the investor wants to tear down your house so that they can use your lot as part of a larger project, they might be willing to pay a lot more than the fair market value of your home. Even if that’s the case, you still need to know what your starting point is. To find the fair market value of your home, pull recent sales of comparable homes in your neighborhood to find the market price per square foot. You can use the MLS (multiple listing services), or real estate search portals like Trulia and Zillow. Figure out where you want to live if you sell your house. If you sold your home to the investor at fair market value, would you be able to buy a comparable home in a neighborhood in which you would want to live? If not, figure out how much it would cost to buy the home you want. Then calculate how much it would cost you to move. You want to get estimates from movers, add in lost wages for any work you’ll have to take off, and if you think you’ll have to rent for a short period of time, estimate what the deposit will be. Add your estimated cost to move to the cost to buy the home you want and that should be the lowest number you accept. Make your counteroffer. If you don’t know how to counter offer real estate, have your attorney draft the document (putting the offer on your lawyer’s letterhead will make the investor take you more seriously), and deliver it to the investor. Then you wait and see what they come back with. Receiving an unsolicited offer to buy your house could feel like a gift—or a breach of privacy—depending on how you feel about moving. And any savvy investor will understand that. As long as you understand their motives and get clear about yours, you will come out of the negotiations ahead.